July | 2015 | Huntingdon Landmarks, Inc. The 4 and More Cultural District Partnership operates under the umbrella of Huntingdon Landmarks, Inc. 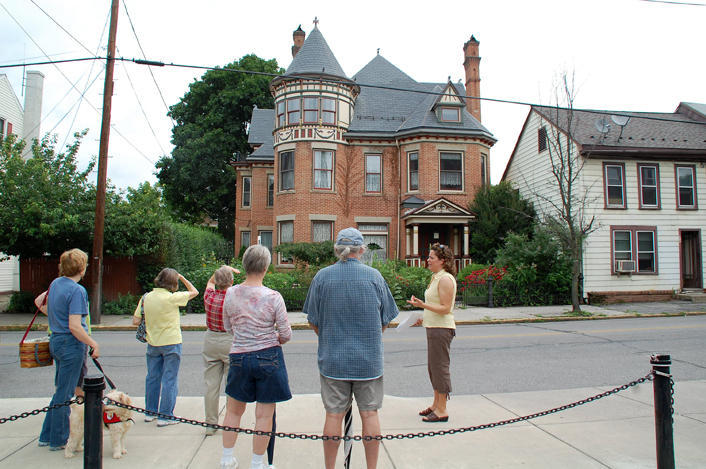 The partners host monthly lunch and learn lectures September-May, and weekly Wednesday morning walking tours during the summer. free walking tours of downtown Huntingdon’s 4 and More Cultural District. All tours begin at 10am on Wednesdays at Merchant’s Park on the corner of 6th and Penn Streets in downtown Huntingdon and last approximately 60 minutes. The tours are provided by volunteer guides free of charge, but free-will offerings are accepted to benefit local organizations. The tour for Wednesday, July 8th will focus on the growing pastime of geocaching. The tour will be guided by Dr. Kathleen Jones of Huntingdon, and hand-held GPS units will be available for use courtesy of the Friends of Raystown Lake for those not having their own or a GPS-enabled smart phone. On Wednesday, July 15th, Huntingdon resident, Ilona Ballreich will guide a tour of public art in the downtown. The tour will showcase murals and monuments dedicated to Huntingdon’s history and scenery. Dr .Philip Dunwoody of Huntingdon will guide participants through the practice of Tai Chi on Wednesday, July 22nd. Tai Chi is a martial art form touted for its health benefits that according to some sources may date back to 12th century China. Participants will celebrate Huntingdon’s designation as a Tree City, USA by the Arbor Day Foundation with a tour of urban forestry on Wednesday, July 29th. Local reporter and trained forester, April Feagley will guide the tour focusing on tree identification and maintenance. Huntingdon’s history of stained glass artistry will be featured in the tour on August 5th. Local resident and officer in the Huntingdon County Arts Council, Julie Price will guide the tour of downtown buildings with stained glass windows. A few Huntingdon residents have become well-known for stained glass art, including Ann Dorris Chisolm who produced an award winning piece for the 1883 World’s Fair, which will be featured on the tour. The walking tour season wraps up on Wednesday, August 12th with a guided tour of Huntingdon’s churches. The tour will be led by Huntingdon County Historical Society executive director, Kelley Kroecker, and will showcase the history and architecture of some of downtown Huntingdon’s church buildings. The 4 and More Cultural District is a partnership of the Huntingdon County Historical Society, Huntingdon County Library, Huntingdon County Arts Council and the Huntingdon Health and Wellness Association, and operates under the umbrella of Huntingdon Landmarks, Inc. More information can be found at HuntingdonLandmarks.org or Facebook.com/4andMoreHuntingdon.